Esse é o beija-flor que todos os dias visita minha janela onde há um alimentador de beija-flores com quatro flores vermelhas artificiais. É gratificante poder ver suas asas, suas penas e suas cores de tão perto, e ainda sua língua tão fina e comprida que de vez em quando está à mostra. Tão doce convivência me garante a ilusão de que entendo de beija-flores. Tenho esse alimentador de beija-flores há alguns anos, o qual, desde então, cativou esse beija-flor em especial. Não sei se é o mesmo pássaro de fato, mas seu comportamento indica que sim. Assim, ele resolveu se apossar das flores de plástico e passa o dia vigiando-as com os cuidados de um dedicado guardador de tesouro. De vez em quando ouço um forte bater de asas entre beija-flores. É o dono das flores afastando o inimigo. O invasor não tem perdão e recebe uma sonora "asada" em pleno ar e desaparece na imensidão do espaço além dos telhados. Poucos conseguem ultrapassar o bloqueio da pequena fera vigilante, mas não por muito tempo. Apesar da notável valentia, há também momentos nos quais esse beija-flor fica gentil e até cavalheiro. Como um recurso de conquista, ele permite que a fêmea se aproxime e também beba do farto "nectar". É quando surge a chance de ver dois beija-flores na minha janela. A chuva não o impede de fazer seu trabalho, pois o telhado da casa protege suas flores. Podem vir os trovões e os ventos que ele não abandona suas protegidas. Não importa se o frio o obriga a encolher-se, deixando-o ainda mais pequenino, mas não menos bravo. This is the hummingbird that everyday visits my window where there is a hummingbird feeder made of four artificial red flowers. It is gratifying to see its wings, its feathers and its colors from so close, as well as its thin and long tongue that once in a while is out for us to see. Such sweet coexistence guarantees me the illusion that I understand hummingbirds. 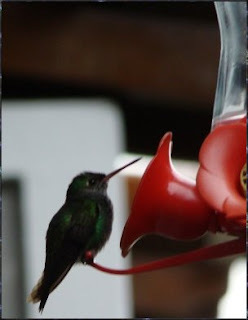 I have had that hummingbird feeder for some years now, which, ever since, has captivated this particular hummingbird. In fact, I don't know if it is the same bird, but its behavior indicates that it is. Thus, it decided to take possession of the plastic flowers and spend its day watching them with the care of a dedicated treasure guardian. Once in a while I hear a strong beat of wings among hummingbirds. It's the flowers' owner chasing an enemy away. The invader doesn't get mercy and receives a resonant "wingshot" in the air and disappears in the immensity of the space beyond the roofs. A few get through the blockade of the tiny vigilant guardian, but not for too long. 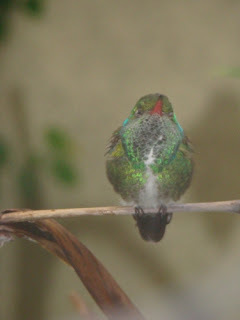 In spite of its notable bravery, there are also moments in which this hummingbird becomes kind and even a "gentleman". 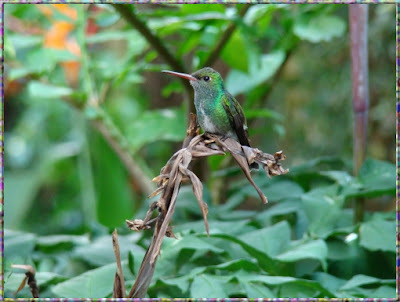 As a conquest resource, he allows the female hummingbird to approach and also drink of the abundant "nectar". This is when the chance of seeing two hummingbirds in my window appears. The rain doesn't stop it from doing its job, because the roof of the house protects its flowers. Thunder and wind can come but it doesn't abandon its object of protection. It doesn't matter if the cold forces it to huddle a little, which makes it even smaller, but no less brave.